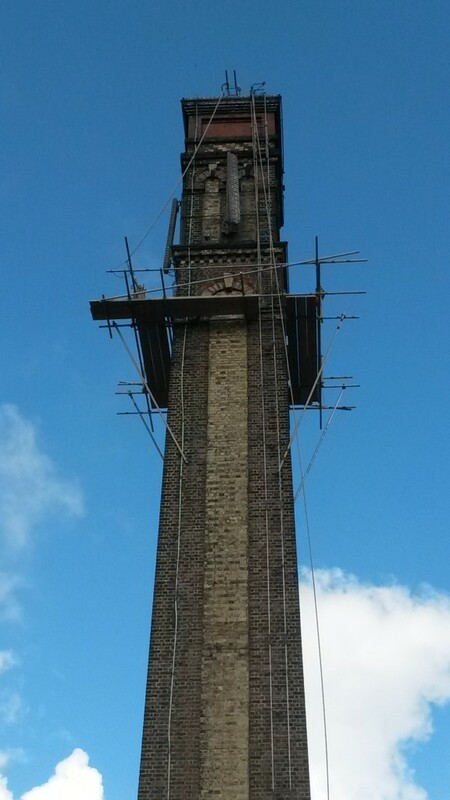 When I was told that the British Engineerium’s chimney had been scaffolded to facilitate brickwork repairs, I contacted owner Mike Holland within seconds for a vertical tour. I envisaged a series of platforms around the historic tower, which can be seen from much of Hove. Providing access to each platform, obviously covered in shrouding for extra safety, would be a number of just-above-head-height steps so that the top of the 100ft obelisk could be reached in relative comfort. I couldn’t have been more wrong. Upon arrival at the Engineerium, my guest – new Latest columnist and commercial surveyor Grant Crossley – and I were greeted by a rather ominous overcast sky. This was the perfect backdrop for the single ladder, attached about one foot away from the Grade II* listed behemoth, that provided the sole means of access to a makeshift platform at the summit. Bernie from Tarrant Specialist Earthing, the firm of contractors carrying out renovation work, clambered up at break-neck speed. This probably gave me a little too much confidence, as my first attempt at a climb was unsuccessful. I made the mistake of looking down. Grant’s bravado as Latest new boy saw him through though. I couldn’t miss out – and at least looking straight ahead on the way up gave me the opportunity to inspect the gorgeous coloured bricks during the long ascent. Fifteen minutes was spent at the top of Hove picking out landmarks in every direction. The Engineerium began as the Goldstone Pumping Station and took its name from the Goldstone Valley below. Needless to say, there are breathtaking views across the valley but many unanticipated sights too. The nearby greyhound track is unexpectedly large, as are the hidden playing fields of Blatchington Mill School. 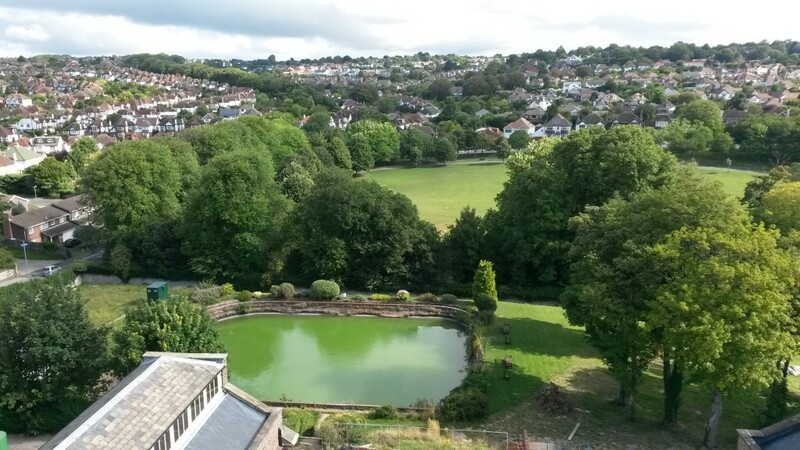 Most surprising is the size of the Engineerium’s own cooling pond to the north of the old pump houses. And many don’t know that it exists. Bernie explained that the platform is pulled up by hand after an individual has scaled the endless ladder to make the initial fixings. Other poles, then planks, follow. I’d love to watch next time this takes place. A running theme in this column is hidden spaces; whether that means clock towers and crypts, or cellars and spiral staircases. The water industry provides the best of these. Reservoirs, sewage tunnels, pipes and pumping stations are each so removed from our normal lives that they delight when disturbed.